POSTCARD #89: Delhi: Why is it that the back of somebody’s head is so much like a closed door? I’m standing in a line of people in the food store waiting with my purchases for my turn to pay at the check-out. It’s taking a long time and I’m wondering if I’m feeling a bit miffed about that, yes or no – anyway there’s this quiet awareness, curious and interesting. When I see the back of somebody’s head I immediately want to turn that person around with a hand on the shoulder and see who it is…. Hi there! How’re you getting on? But, can’t do that in the food store check-out line, of course, we’re all strangers and each of us isolated in this slightly tetchy discontent about having to wait… what’s happening down there? This is our predicament, looking at the backs of people’s heads in front of us, all the way down to the front. I’m moving my head from side to side, trying to see past all the other heads. But all the way down the line, other heads are doing the same thing and my line of vision is blocked by somebody else’s head moving from side to side because the head in front of them is in the way too. Funny to see all these sideways wobbling heads. I have a quick look behind me and everybody is having to do the same thing to see past me… no laughing matter, there’s a grumbling in the air. Stand quietly, feet apart, evenly balanced and look at the back of the head of man in front. There’s a kind of frontality about the head. The face is on the front, of course, eyes look forwards, incoming data is received mostly from the front – ears are on the sides, but sideways functioning is limited. No sensory receptors on the back that have the function of sensing what’s going on in the world. Any backwards movement is blind, no rear-view mirror… trucks reversing out with that automatic beep-beep, beep-beep, beep-beep sound. The human body is like a picture painted on a flat cardboard cutout. 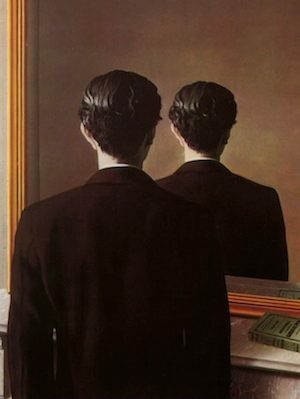 The whole back of my head and body is one large blind spot; a not-seeing that I know is there. Turn away, and suddenly the thing I was looking at is gone! Ignorance is a kind of ignoring – it has intelligence. I have the ability to overlook things, watch TV every day, and have ‘preferences’. I choose to be unconcerned about wars created by politicians. Prefer to be mesmerized by the reflected screen-glow of the digital device...searching for an object and never finding it. Move on, click something else, the appearance of reality holds my attention for a moment, then click on the next one. Am I really the ‘me’ I think I am? I can see that the ‘self’ is a construct, but the truth is hidden from me because there is no solid enduring self that sees it like this. Idiosyncratic humanness caught in an unexpected circumstance. Waiting, but not that suspended state of waiting for the thing I’m waiting for; more like just waiting with the waiting. Being with the gentle in-breath/out-breath, the temperature of the air, the feel of the body standing there, and an easy observation of everything that’s happening. Balance, openness – poised between things in a place of emptiness. It’s all just moving along. There’s a gentle questioning of events as they arise… what’s this now? The moment transforms itself, observing the curiosity of it, mindfully placing one foot after the other, slowly and carefully, on stepping-stones that lead out into the river and over to the other side. The enigma of selfless willing. No ‘you’ in view in the queue. Holding on to letting go…I love the idea of this. I love the shift from lack of connection to frustration to mindfulness in this post! Thanks Jeff, compassion for the human predicament – opening up to this makes it easier to see the self-created intensity. Yep, we’re all in the same boat. Here in India I’m not picking up on language cues, can’t hear the current of dialogue, and an opportunity arises to disengage from the ‘I’ we all suffer from. It’s the situation itself that pushes me out of the claustrophobic ‘self’… what else is there to do anyway? I’ve been appreciating the conversation this post has inspired. Interesting, that we’ve all been standing on lines, having these thoughts and experiences, which we only have alone, yet have come here to share them together. There’s something about your quiet way that invites opening. Queues as orderly lines of suppressed hatred? Hariod my friend, I have to say I’m a bit puzzled by this comment. Could you say a little more by way of explanation? Just want to add that it took me a while to “like” Hariod’s initial comment, because I wasn’t sure I understood it. Then I thought I finally did, and now I’m again unsure. I think that Hariod is perceiving a dimension I don’t see but would like to. There are always so many layers! We are always being, and we are always being in one place and cannot be in another. If we truly see our being, it makes no difference where we be. Why must being still in a queue or in stopped traffic or the throes of calamity be any different sort of being than stillness in our beds or gazing at our loved ones or sitting long enough to watch a beautiful sunrise? When I am being in a line or other crowd, this is the only place I can be and these are the beings being with me (frankly I include non-human beings as well). We are by fate and circumstance suddenly and instantly a thing. We are the queue of people waiting (being) together. By this I am bound to the beings around me. We are no longer disconnected strangers, but a throng of beings participating together in a mutual activity. I talk to them, I sing, I offer assistance, I pay for the coffee of the being behind me. We are one.